Personal | What The Sooke? Coming up this Saturday, January 12, 2013 is WordCamp Victoria 2013. If you are curious about blogging or how you can learn new skills and hear about new tools to blog better, WordCamp Victoria is where you want to be this Saturday. Wow. What a ride. The Vancouver Canucks’ 2010-2011 season was nothing short of spectacular. While I am obviously not happy about the result last night, and I won’t even get into the idiocy in downtown Vancouver that followed, I’ve never enjoyed watching my team play hockey more than this season and playoff run. Thanks boys! How happy I would be with the result! New Look – Back and Better Than Ever! You may have noticed some things have changed ’round here! That’s right, 642Blog.ca is now known as What The Sooke?! I made the decision to move the blog to this new address a few weeks ago and have been working hard to get it all put together. I found out that moving a blog is nearly as complicated (and as much of a pain) as moving to a new house. Hopefully everything still works! So, what’s new? Theme. A fresh, clean look is what I was after. With no exaggeration, I must have perused hundreds of themes before deciding on this one. Logo. Jason from Inktvis Creative/DiscoverSooke did an outstanding job on both my blog logo and my new real estate logo, pictured below in the footer of the blog. Listings. I’ll now feature my listings on the blog – You can find them under the category ‘listings,’ oddly enough! More content! This whole exercise has been a lot of work and has really inspired me to put it to good use. I have some great ideas for articles and videos and I intend to post much, much more often than I have been. Featured Posts. Articles or listings of particular interest will now be ‘sticky’ and featured in a big featured posts slider on the front page. I hope you’ll enjoy the new What The Sooke!? as much as I have enjoyed putting it together. As always, your comments are welcomed and encouraged – use the comment form, or send me a message here. I think it should be a rule that REALTORS® have to complete one real estate transaction of their own every five years at a minimum. This would help put things in perspective and make us better agents. Having just completed a transaction for me and my family, I can certainly relate to the stress, anxiety, and sometimes, sleepless nights that a buyer experiences. I had purchased a home before, but it was 7 years ago. When we do many transactions each year for different clients, they tend to become routine (in most cases) and we can lose sight of the client experience. As much as we all think we understand our clients, it is worthwhile to become one every now and then to make sure. In my experience, I had at least two sleepless nights, and more anxiety than I care to admit, wondering what the hell I was thinking buying a bigger house. I’m a pretty logical, reasonable guy, so this was not an impulse buy in the least. I calculated, re-calculated, extrapolated, and otherwise contemplated this purchase for the past 6 months at least. Once I had found the right house, I triple and quadruple checked my math to make sure I wasn’t committing financial suicide. I think I got a pretty good deal on my house – you’d think an experienced agent would know! But all that doesn’t matter when those nagging, anxious thoughts creep into your brain late at night! No matter how illogical and frivolous these thoughts are when you really think about them, it can scare the crap out of you and shake your confidence so easily when they run away with your brain. Everyone feels this way. Talk to your friends and colleagues. Talk to co-workers and your family. Chances are they will have had similar thoughts and feelings when they purchased their homes. And it’s not just the first-time jitters. I talked to another agent friend of mine who has completed five or six transactions in the last 20 years or so, and he still freaks out every time. The key is to work with a team of advisers (mortgage broker, REALTOR®, financial planner, etc.) that you trust. They can help separate the important, key details from the noise of your subconscious mind that is keeping you up at night. For me, all the anxiety and stress disappeared the morning after the move. Here we were in our ‘forever’ house: me, my wife and our new baby daughter, and a pile of boxes and disarray. And it was perfect. Were you stressed about your first home purchase? What about your second or third? Did it get any better? When did it pass, and what advice can you offer readers about home-purchase anxiety? As long as I write this blog, I’m certain to never forget that two years ago today, February 2nd, is the day that Lindsay Buziak, a 24 year old real estate agent from Victoria, was murdered in the house she was showing to prospective buyers. In the month or so before the anniversary of her death, searches for “Lindsay Buziak” and related keywords surrounding the case show up with increasing frequency on my blog stats because of what I wrote the days after the murder and on the one-year anniversary in 2009. It’s only natural I guess – people scouring the Internet for information on the case: clues, speculation or rumours. I’d like to think that some of the traffic is law enforcement, hoping that somebody somewhere has posted a new tip or clue about the case. Because it’s ridiculous that the police have next to nothing to go on. She was killed in the early evening in a residential neighbourhood where people would be getting home from work. Somebody saw something. Somebody knows something that will lead to an arrest. Saanich Police concede that she was intentionally targeted and that the murder was planned many weeks in advance. You can’t plan something like that and have no one know about it. “Lindsay was intentionally targeted, she was intentionally lured to the home and she was intentionally killed.” – Saanich Police spokeswoman Sgt. Julie Fast. Lindsay’s family has announced a reward of $100,000 for information leading to an arrest. The Victoria Real Estate Board and the Canadian Real Estate Association have each contributed $25,000 to the reward pool, in a show of support. What happened to Lindsay, while not a direct result of her profession, could happen to any of us in real estate. All too often we get complacent in the chase for another deal. If something doesn’t feel right, don’t do it – listen to your instincts. I really hope I never have to write another Lindsay Day post on this blog. Please, if you know anything about this case, no matter how small it may seem, call the Saanich Police tip line at 250-475-4356. 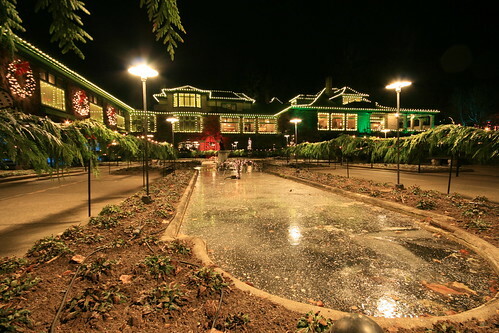 Last night, my wife and I got out and enjoyed the crisp December evening and headed out to world-famous Butchart Gardens on the Saanich Peninsula. 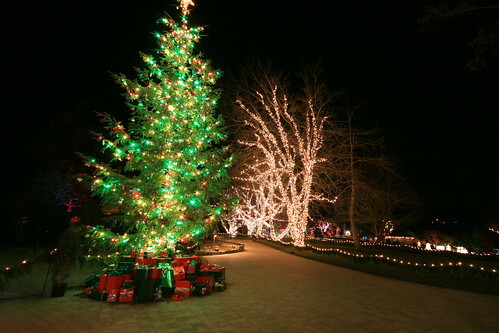 Every year they decorate the gardens in thousands of lights, creating a truly magical Christmas experience. Despite the sub-zero temperatures, it was a gorgeous, starlit evening, and the lights were amazing. The gardens are decked out in a Twelve Days of Christmas theme, so along the garden paths there are little vignettes displaying the different parts of the famous song. It was fun to hear everyone reciting or singing “fiiiiiive golden rings” and so on as they approached the various displays along the route. I brought along my camera, tripod and shutter release to get some long exposure shots of the lights. Lights at night are one of my favourite things to photograph, and I think the results turned out quite well. There was a brass quartet playing Christmas carols, a carousel, and a skating rink set up for all to enjoy. The admission might seem a little steep at $23.50 for adults (lots less for kids, price list here) but if you buy a yearly pass and go more than twice it pays for itself (many will go once a season, or more if you have guests in from out of town). 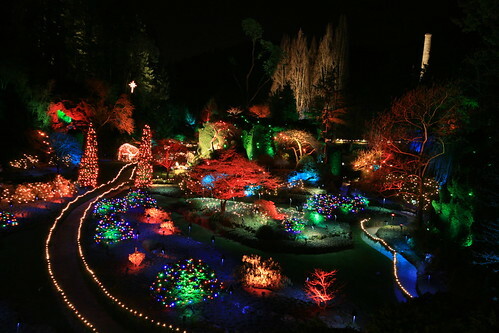 I hadn’t been out to Butchart Gardens in about 5 years or more, and I had forgotten how lucky we are to have such a world-class attraction in our back yard. It truly is a top-notch operation and it’s no surprise how popular it remains, after over 100 years in existence. Enjoy these photos – you can view the rest on my Flickr page.